Villa starting XI: Guzan, Hutton, Richards, Lescott, Amavi, Crespo, Westwood, Gueye, Veretout, Gestede, Sinclair. 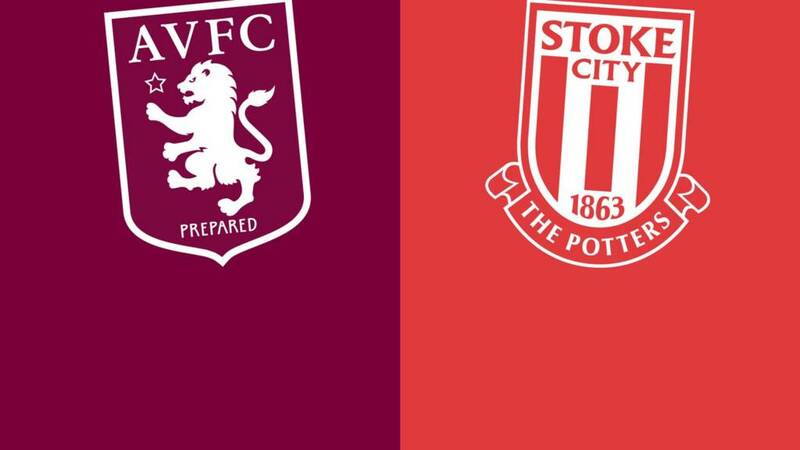 Stoke starting XI: Butland, Johnson, Cameron, Wollscheid, Pieters, Adam, Whelan, Walters, Krkic, Arnautovic, Diouf. That's it from me on this live text. Head over to our main live page for all the reaction. Boos inside Villa Park tell us that is the full-time whistle and another defeat for Aston Villa. Stoke claim a second successive win and move away from the relegation zone. A Villa free-kick comes to nothing, a first home win of the season still missing. Fans are leaving Villa Park at quite a pace. Five minutes to be added on, five minutes between Stoke and a second win of the season. I might have been bit hardh on Mame Biram Diouf, he's going on to a stretcher. He's sitting up, mind. Meanwhile, Jordan Ayew has hit the side-netting from a tight angle for Villa. Mame Biram Diouf has spent a lot of time of the turf today and he's down again. Joselu is preparing to come on as Villa fans in the stand look very disgruntled. Has it been a bit muddled for Villa today? Tim Sherwood is looking a touch stressed on the touchline, perhaps because his tactics have not worked. His fist-half wing-back system left his forwards isolated, while a back four in the second half left a huge hole for the Stoke goal. A final throw of the dice for Villa? Carles Gil is on for Ashley Westwood. Very, very quiet inside Villa Park, the home team providing their fans little to cheer about. Stoke have plenty of men behind the ball, snuffing out an Alan Hutton cross. Substitution for Stoke, with goalscorer Arnautovic making way for Marko van Ginkel. A defensive move. No inspiration from Villa, no sign of searching for that equaliser. As I write that, Rudy Gestede gets free down the right and shoots from outside the box, but it's straight at Jack Butland. Marko Arnautovic cuts through the Villa defence to give Tim Sherwood plenty to think about. You can't see the Villa defenders on this, and to be honest they weren't anywhere close to the Stoke forward. Swing Low, Sweet Chariot rings out inside Villa Park, probably because of England's crunch Rugby World Cup game tonight. Villa could do with some meaty forward play right now. Goals mean changes. Stoke remove Bojan from Ibrahim Afellay, Villa bring on Jordan Ayew for Scott Sinclair. Immediately, Villa should be level, Micah Richards heading wide at the back post when completely unmarked. This game has sparked into life. Stoke have the lead, Aston Villa ripped apart through the simplest of moves. Marko Arnautovic has the freedom of Villa Park on the edge of the penalty area, in the gap between the two centre-halves. He's slid through, waltzes through and finishes off the post. Are the Villa fans just starting to turn? The home side easily defend a corner, the fans urge them upfield, to no avail. Micah Richards almost gets himself into a tangle too. Second half currently without the urgency of the first. Villa, now right to left in the second half, have come out with decent purpose. Good work between Idrissa Gueye and Jordan Amavi forces a corner that Stoke clear. "Ray Parlour.. Carrot top... But loves parsnip soup being served up in the press room at half time"
Back under way at Villa Park, with the home side making an interesting change. Off goes Joleon Lescott, on comes Jack Grealish. It looks like a flat back four for Villa, as part of a 4-4-2. Just looking at the replay of that Arnautovic disallowed goal again. Possibly level, possibly not. Villa were opened up very easily, mind. You can see from Villa's average positions that their three centre-backs are clearly holding their positions. Perhaps Scott Sinclair (9) needs a bit more support up front though? There's the whistle. Neither side pleased, neither side unhappy. Half-time approaching in what's been a pretty decent game. Both sides have looked to get forward, both lacking that cutting edge. There's been two contentious decisions - Stoke will feel they had a goal unfairly chalked off, Villa will think they should have had a penalty. One minute added on. Former Villa midfielder Ian Taylor is in the crowd. He's got double motivation to see a Villa win today - he's a former Port Vale player. "Cameron got his feet into a dangerous position. If you are telling me that Cameron cleanly played the ball, I don't think you're right." "I think Stoke are hard-done-by there. It would have been a good goal for Arnautovic because he started the move." Stoke think they are in front, only for the offside flag to deny them. Ball in from Bojan, Marko Arnautovic sticking out a leg to deflect the ball past Brad Guzan. Is he onside? Replays suggest he's level. It's all just settled a little, with clear-cut chances very much at a premium. Like I said before, lots of industry, but not a great deal of quality. Mark Hughes, the sliver fox, sits on the Stoke bench with his elbows on his knees and his red tie drooping limply from his neck. He looks as concerned as a man whose daughter has just gone on a date with Pete Doherty. Ooofff, good save by Jack Butland, tipping over as Joleon Lescott powers a header from a corner. Had the whistle gone? It had, for a push by Lescott. Still good from Butland, though. Even those Villa wing-backs are having an effect, with Alan Hutton getting down the right to deliver a cross to the empty Stoke box. Lots of industry from these teams, we're just missing a touch of quality. "It's the sort of game where you feel that the first goal, if there is one, could be very important." Villa have got a foothold now, much better than that early wobble. Gestede and Sinclair have linked well, but a chase for the former Swansea man just fails. Jack Grealish, on the Villa bench, is chewing some gum rather glumly. Charlie Adam! What an effort from inside his own half from a man who's got form for this sort of thing. Adam, who scored from the halfway line against Chelsea last season, wasn't even in the centre circle when he spotted Brad Guzan off his line. The effort was going towards the top corner, with the scrambling Guzan avoiding embarrassment with a leap and tip around the post. Still end-to-end, a Stoke attack down the left thwarted by two sliding Villa defenders. Full-bloodied, pacy stuff. The crowd right into it too. Pretty watchable game this, reasonably end to end. Arnautovic goes down in the Villa box after a nice ball from Bojan, but no one really expected Mike Jones to point to the spot. For students of the crowd, there was a wonderful shot of a Villa fan off his seat to give Arnautovic a piece of his mind. Villa finally get a hold of the ball and almost cause Stoke a few problems. Rudy Gestede flicks on to almost release Scott Sinclair, but Stoke scramble to avert the danger. John Motson, on MOTD commentary, reckons Villa are playing with three centre-halves and wing-backs. He looks to be spot on. Either way, Stoke are finding oceans of space. You know what, Stoke are all over Villa in the early going. A long ball from the back finds Marko Arnautovic on the Stoke left. He cuts in on to his right foot, but shoots over. The resulting corner came to nothing, but the movement of the Stoke front four looks likely to cause problems. Villa looking short of ideas going forward early on. Early chance for Stoke, who perhaps should be ahead. Jon Walters' lovely flick puts through Mame Biram Diouf on the right, his shot blocked by a lunging Micah Richards. Villa opened up very easily. Stoke are playing right to left as I look on, white shorts and stockings (always stockings, not socks). Lots of emtpy blue seats in the lowers stands at Villa Park. We're under way at a pretty noisy Villa Park. They've been down because it takes time, but you pick them up. That's the nature of the job. We expect a tough game, it always is against Mark's team, but a game we can win. I tell you what, the tunnel at Villa Park is a vast old cavern. You could park a coach under there. As the players emerge, a huge banner goes over the Villa fans, as big as the penalty area. Where do those banners come from? Where do they go when they've been passed over the fans? Does someone sleep under it between matches? The subs have emerged from the dressing room, making their way to the bench before the starting XIs come out. Peter Crouch signs an autograph for a fan on the front row. The teams are in the tunnel, Villa in their traditional claret, Stoke in their red and white. Final Score's John Acres at Villa Park:"This is the view as I wait for the manager pre-match interviews for a worldwide audience. When Tim Sherwood arrived, he said I was a bit trendy for the BBC!" Final Score's John Acres at Villa Park: "Both teams like to play, and attack, but both have rather neglected the other end of the pitch so far, so it should be entertaining, and the result significant... the loser will be in the bottom three." It's grey at Villa Park, where the claret and blue seats are still far from full. It's chilly, perhaps the coldest day of the season so far. A day for coats and scarves, or maybe your replica shirt over the top of a hoodie. Mark Lawrenson thinks this match will end in a 2-1 victory for Stoke. "I see their improvement continuing at Villa Park because Mark Hughes has got quality in his squad, and he has also got some scrappers," reckons our football expert. "These sides sit side-by-side in the bottom four but there seems to be a difference in expectation among the respective managers. "It appears that Villa's Tim Sherwood has resigned himself to a season of struggle, or at least consolidation. "Stoke boss Mark Hughes is confident they are better than results suggest. "Villa need to take the initiative and show the same is true of them. But their home form has been poor and Stoke will fancy their chances of a third straight win at Villa Park." BBC WM's Steve Hermon: "It sounds a bit too early to say this but this afternoon is must win for Aston Villa, who haven't won since the opening day of the season and find themselves 18th in the table. "Tim Sherwood has mentioned that his young players are still settling in but they do have experienced players (and former Premier League winners) in Lescott and Richards at the heart of their defence. They need to step up to the plate today, along with the likes of Guzan and Hutton. "Their key weapon is the head of Rudy Gestede, who has score 21 headed goals in just over two years, which is more than any other player in all four English divisions. Get the ball into the box towards Gestede and Villa could walk away with three crucial points." In a week where everyone has got excited about which international team he wants to play for, Jack Grealish has to make do with a place on the bench in an Aston Villa side selected with caution in mind. Stoke are without Xherdan Shaqiri, who picked up a thigh injury last week, with his place going to Mame Biram Diouf. But expectation is a funny thing. Ask Stoke, only two points and one place above Villa, yet with no sign of alarm bells ringing. A summer of eye-catching recruitment was followed by a sluggish start, tempered by a first win at home to Bournemouth last week. They may only be parted by the slenderest margin in the table and and a slab of M6 tarmac, but the Villains and the Potters don't share much else. That's when Aston Villa manager Tim Sherwood sounded the alarm, with last week's 3-2 defeat at Liverpool followed by the boss saying his team face a battle to stay up. He might have a point. Villa, no higher finish than 15th since 2012, have not won since the opening day and are in the bottom three. Premature pessimism, or an early adjustment of expectations? How early is too early to decide that you're in a relegation battle? No one wants to be in the drop zone come spring and the accepted wisdom is that bottom at Christmas isn't too clever. But what about the end of September?